The world on the other side of Alice in Wonderland's looking-glass is not what it seems, but the mirror-like physics of the superconductor-insulator transition operates exactly as expected. Scientists know this to be true following the observation of a remarkable phenomenon, the existence of which was predicted three decades ago but that had eluded experimental detection until now. The observation confirms that fundamental quantum states, superconductivity and superinsulation, both arise in mirror-like images of each other, which could lead to development of supersensitive and energy-efficient sensors, detectors and logical switches for science and communication, memory storage and other emergent technologies. "The behavior we have demonstrated is exactly the behavior that was predicted and expected," said Valerii Vinokur, an Argonne Distinguished Fellow in the Materials Science division of the U.S. Department of Energy's (DOE) Argonne National Laboratory. Vinokur and his colleagues observed the phenomenon, called the charge Berezinskii-Kosterlitz-Thouless (BKT) transition, in a microscopically thin film of superconducting niobium titanium nitrite. The charge BKT transition is the mirror-like counterpart to the vortex BKT transition that scientists have observed many times in superconducting materials. Vinokur and his collaborators at the California Institute of Technology and Novosibirsk University in Russia published their findings online March 6, 2018, in Scientific Reports. "The experiments carried out by our team conclusively establish the existence of the superinsulating state and the validity of its foundational concepts, including the fundamental concept of charge-vortex duality," said Vinokur, who also is a Senior Fellow in the University of Chicago's Computation Institute. "The basic concepts behind our knowledge about the universe at its deepest level are based on the concept of duality." The duality concept in physics holds that fundamental sets of phenomena seemingly exclude each other but represent two sides of a coin. The best-known example of duality is the wave-particle duality of light appearing in the quantum realm. Superinsulating and superconducting materials, which are exact opposites, realize duality between electric and magnetic effects. Instead of transmitting electric current without any loss of power, as superconductors do, superinsulators completely shut off the flow of charges under an applied voltage. This means that mirroring superconductors have infinite conductance, while superinsulators have infinite resistance. The latest finding builds on work published in 2008 by Vinokur and his associates that experimentally established the existence of the superinsulating state, while also proposing that it "mirrors" the behavior that occurs in the superconducting state, deriving it from the most fundamental quantum concept, the uncertainty principle. 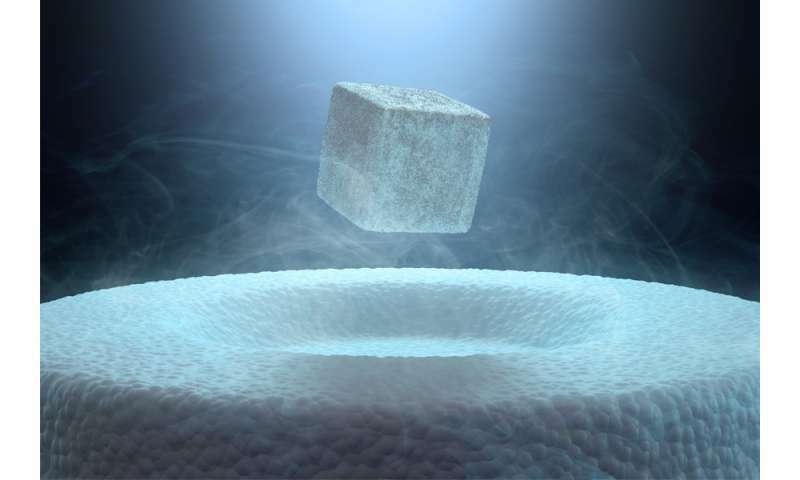 Theoretical physicists at CERN (the European particle physics laboratory), the University of Geneva and the University of Perugia—Cristina Diamantini, Carlo Trugenberger and Pascuale Sodano—had predicted the existence of this superinsulating state, dual to superconductivity, in 1996. But so unexpected was the discovery of the superinsulating state that Vinokur's team was initially unaware of the prediction. The BKT transition that lies at the foundation of the superconductor-insulator duality is named for the late Vadim Berezinskii, Michael Kosterlitz and David Thouless. Kosterlitz and Thouless collaborated in the early 1970s to develop their theory of topological phase transitions, which are quite unlike the phase transitions that were commonly known in the everyday practice of physics at the time. These customary phase transitions manifest as an abrupt change in the state of matter such as ice melting to water, or water boiling to vapor, at some critical temperature. Topological phase transitions are rather like untying the knots in a necktie, however. "You have a clear change in the properties of the system without making any visible material changes in the properties of the tie," Vinokur said. Berezinskii had independently developed similar ideas, eventually leading to numerous observations of vortex BKT transitions in thousands of superconductivity experiments over the decades. However, until now, scientists had never conclusively observed the mirror-like reflection of the vortex BKT transition—the charge BKT transition—on the superinsulating side of the superconductor-insulator transition. Kosterlitz, Thouless and Duncan Haldane shared the 2016 Nobel Prize in physics for "theoretical discoveries of topological phase transitions and topological phases of matter," having developed the advanced mathematical methods needed to explain the phase transitions that occur in unusual states of matter, including superconducting materials and thin magnetic films. One future avenue of research for Vinokur and his colleagues will be to raise the temperature at which their niobium titanium nitrite compound transitions into the superinsulating state. The transition temperature is now between 100 and 200 millikelvin, which is just a fraction of a degree above absolute zero (minus 459.6 degrees Fahrenheit). But raising the transition temperature to 4 kelvin (minus 452.4 degrees Fahrenheit) would constitute a technological breakthrough. "This means that we could use these materials in space, because 4 kelvin is the temperature of space," Vinokur said. Possible space applications for such superinsulating materials include supersensitive detectors for measuring electromagnetic radiation and other phenomena, and switches for electronic devices, such as energy-saving diodes.